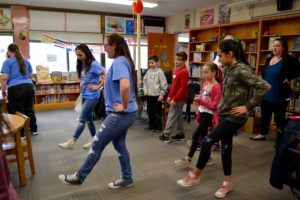 Levittown fifth-graders in Valerie Dillon’s class at Lee Road Elementary School participated in engaging cultural lessons with nine members of General Douglas MacArthur High School’s World Language Honor Society on April 5. The high school students visited Lee Road’s library and transformed into student teachers during the fifth-grader’s Foreign Language in Elementary School class. With the guidance of World Language Honor Society adviser Nicole Dawson and Lee Road FLES teacher Kelley Kolm, the new partnership allowed the honor society members to serve as mentors and educate younger students in a fun way through five stations. The fifth graders gathered in small groups and rotated to the different tables in the library. While at the stations, students learned how to do the Tarantella (a dance from Italy), create their own clay statues inspired by Easter Island, color by number a photo of Mexican artist Frida Kahlo, participate in a flag contest and create their own soccer jerseys.